JBIC is making efforts to build corporate governance structure in conducting operations with particular attention to integrity and efficiency, as it seeks to fulfill the mission set out under the JBIC Act (Law No. 39, 2011) and realize its corporate philosophy. As JBIC has its shares wholly owned by the Government of Japan, it is subject to the control of the Japanese government, its sole shareholder. Additionally, it is subject to the budget passed in the Diet, inspections by the Board of Audit of Japan, by the Competent Minister, and by the Financial Services Agency whose inspection is delegated by the Competent Minister. 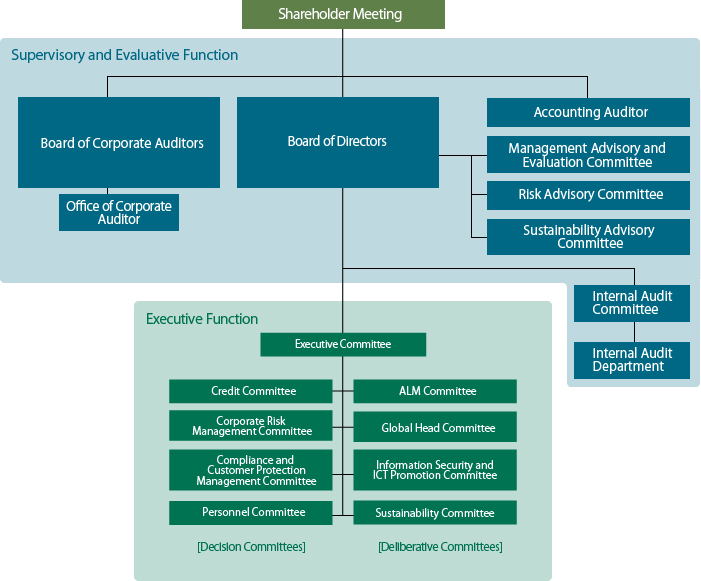 To strengthen the supervisory and evaluative function of the Board of Directors as well as conduct speedy and flexible operations, JBIC has established, in addition to the Board of Directors, the Board of Corporate Auditors and other organs required by the Companies Act, the Management Advisory and Evaluation Committee, the Risk Advisory Committee, the Internal Audit Committee, and the Executive Committee. Furthermore, a variety of committees were set up by the Executive Committee that delegates specific tasks to them. The Board of Directors consists of eight members, of which two members are outside directors as set forth in the Companies Act. The outside directors supervise the conduct of JBIC operations from the point of view of a corporate outsider, apart from representative directors of JBIC. 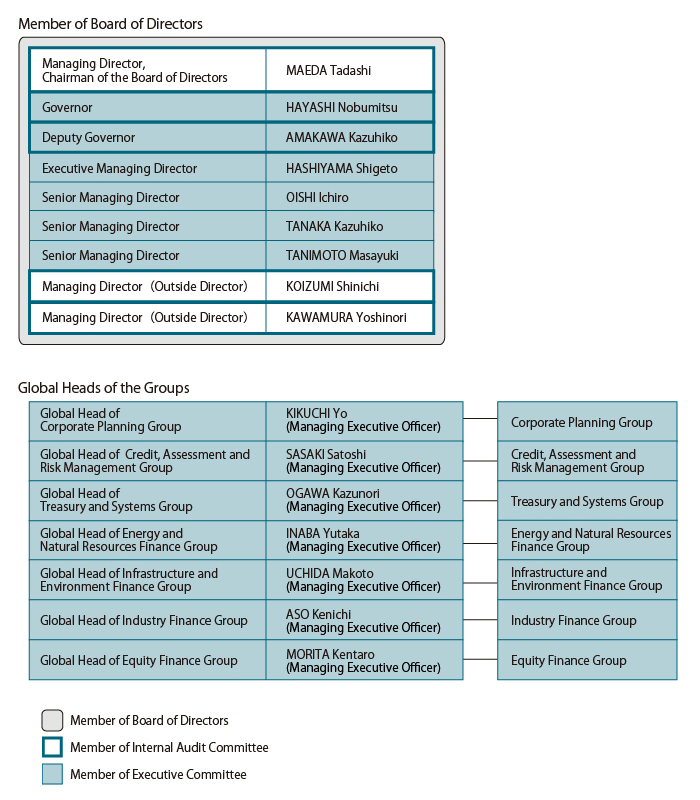 In addition, the outside directors contribute to improving the governance of JBIC as a member of the Management Advisory and Evaluation Committee as well as the Risk Advisory Committee. The Board of Corporate Auditors consists of three auditors, of which two are outside corporate auditors, as set forth in the Companies Act. Outside corporate auditors contribute to improving the governance structure of JBIC, as they cooperate with the full-time auditor in auditing the conduct of its operations. As a section helping them execute their responsibilities, there is the Office of Corporate Auditor. The Management Advisory and Evaluation Committee consists of external experts, including the outside director. They make assessment and offer advice on the matters referred to them by the Board of Directors pertaining to the business operations and management of JBIC. The Risk Advisory Committee consists of external experts, including the outside director. They offer advice on the matters referred to them by the Board of Directors pertaining to risk management and assessment framework associated with large-lot obligors and risk exposure to large-scale projects. The Internal Audit Committee consists of representative directors and the outside director. They make decisions and deliberations concerning important matters pertaining to internal audit, as delegated by the Board of Directors. The Executive Committee consists of representative directors, executive directors, and all the managing executive officers. They make decisions and deliberations concerning important managerial matters, thereby taking responsibility for conducting flexible JBIC operations, as delegated by the Board of Directors. Certain decisions such as financing to a specific project are delegated to the following committees. The Credit Committee makes decisions and deliberations concerning important matters on loans, equity participations, and guarantees by JBIC, as delegated by the Executive Committee. The Corporate Risk Management Committee makes decisions and deliberations concerning important matters pertaining to the corporate risk management of JBIC, as delegated by the Executive Committee. The Compliance and Customer Protection Management Committee makes decisions and deliberations concerning important matters pertaining to the compliance and customer protection management of JBIC, as delegated by the Executive Committee. The Personnel Committee makes decisions and deliberations concerning important matters pertaining to the personnel of JBIC, as delegated by the Executive Committee. The ALM Committee makes deliberations concerning important matters pertaining to the asset-liability management (ALM) of JBIC, as delegated by the Executive Committee and the Corporate Risk Management Committee. The Global Head Committee makes deliberations concerning cross-cutting matters among internal groups, including operational policy for each country or region, as delegated by the Executive Committee. The Information Security and ICT Promotion Committee makes deliberations concerning the use and management of JBIC's information assets, as well as important matters on information security, and cross-divisional matters on ICT such as measures required for the ICT plans and policies which had been determined by the Board of Directors and Executive Committee, as delegated by the Executive Committee. JBIC reconstituted its organization and adopted a mission/sector-specific group structure. Its objective is to strengthen the capacity to formulate projects by bringing together knowhow and expertise in each sector and area, thereby facilitating JBIC to perform the functions in its mission more flexibly and strategically. Specifically, the Corporate Planning Group; Credit, Assessment and Risk Management Group,Treasury and Systems Group, Energy and Natural Resources Finance Group; Infrastructure and Environment Finance Group; Industry Finance Group; and Equity Finance Group were set up, with each Group having departments with special expertise. For each Group, the responsible board member is appointed, and the managing director or a managing executive officer serves as the Global Head of each Group. Each Group is managed in an integral manner under the Global Head of the Group in an effort to conduct speedy, flexible and efficient operations. Pursuant to the Companies Act, JBIC has put in place an institutional structure, including internal regulations, to ensure the proper conduct of its operations and activities, based on the Basic Policy for the Internal Control System decided by the Board of Directors. As an internal control system for overall operations, JBIC has appropriate internal audit procedures to review as well as evaluate their appropriateness and effectiveness and make recommendations to improve them. For these purposes, JBIC has the Internal Audit Committee, which includes the outside director, as a decision-making body independent of the Executive Committee that is responsible for conducting operations. There is also the Internal Audit Department, independent of the line departments and directly reporting to the Governor. The Internal Audit Department exchanges relevant information and cooperates with the Corporate Auditors and an Accounting Auditor for executing efficient internal audit. JBIC has set forth in its Code of Conduct to "Maintain high ethical standards and a law-abiding spirit. Observe our moral code as a JBIC member at all times." Its management and staff members are keenly aware of the public missions and social responsibilities called for in the international community and in civil society. It is also well recognized that any act in violation of laws, regulations, or rules by its management and staff will lead to denigrating confidence in JBIC as a whole and have a materially adverse effect on its operations. Attentive to these needs, JBIC is constantly striving toward compliance and operational integrity. JBIC makes efforts to improve compliance, primarily through the Compliance and Customer Protection Management Committee and has established the Legal Affairs and Compliance Office as an integrated compliance management unit. Each Group and Overseas Representative Office serving as a regional headquarter has an Integrated Compliance Officer, while each department and overseas representative office has a Compliance Officer for making efforts in compliance, such as fostering such awareness among JBIC employees. To foster an in-depth understanding of compliance, JBIC makes good use of its Compliance Manual and provides training sessions for its management and staff members. It also develops a compliance program every fiscal year as a basis for making necessary compliance arrangements and providing relevant training, and follows up on the progress and completion. In addition to the reporting procedures in its ordinary line of business, JBIC has put in place and is properly operating an internal reporting system such that it is capable of finding significant compliance issues at an early stage and taking appropriate remedial action. JBIC recognizes the importance of risk management and has put in place specific risk management systems in accordance with the type of risks to be identified in conducting operations as well as an integrated corporate risk management system. For the operation of these systems, JBIC has assigned individual officers responsible for specific risk management as well as units supervising specific risk management. JBIC has also established the Corporate Risk Management Committee, chaired by the Governor, to discuss and study the effective functioning of integrated corporate risk management. Further, there is the ALM Committee, chaired by the Global Head of the Group responsible for the corporate risk management, to deliberate on asset and liability management. JBIC has also sustained efforts to improve its crisis management system by laying out in advance internal rules regarding crisis management in preparation for natural disasters and the occurrence of other crisis situations. As a result, in the case where the occurrence of a crisis situation hinders or threatens the conduct of normal operations, JBIC will set up the crisis control headquarters, if necessary, in accordance with the internal rules on crisis management and respond quickly and efficiently to restore its operations.